Complete Waste Services Ltd are a fully licensed and insured waste disposal company, providing a fast and reliable waste removal service throughout London, Essex, Kent & Hertfordshire. We take pride in our green approach working hard to ensure that our services meet and exceed your every expectation. We are a tailored and flexible business, all our prices include; labour, loading, transport and disposal fees, our prices are based on weight and volume of waste. We do all the work for you including all heavy lifting and loading. No job too big or too small, you only pay for the amount of space required. Our customers and the environment are our priority. 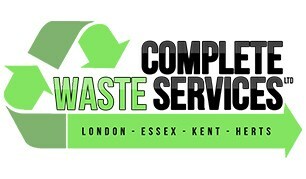 Our trustworthy and friendly team are trained and licensed to responsibly clear and manage your waste. Duty of care: waste transfer note is provided upon completion of all jobs. We are an expanding business aiming to create substainable employment through waste & recycling. We sweep & clean up after all jobs, hassle free no hidden costs, loyalty card scheme - upto 50% off, 24 hours a day 7 days a week. Many thanks for looking at our page, we look forward to hearing from you soon.